A third major effort to kill the long-delayed eastward extension of Montrose Parkway to Veirs Mill Road is underway. The war-on-cars Montgomery County Council is due to vote on the funding for the project in January. Killing the road or delaying it further would not be well-received by their constituents, who are stuck on the few existing east-west roads during rush hour daily. Then again, some on the Council sealed their electoral fates this fall, when they voted to kill the Midcounty Highway Extended (M-83), so maybe they have nothing to lose. In times when radical ideologues put political whims and developer interests above their constituents, and are derelict in their duty to provide essential infrastructure, it's worthwhile to review the facts. 1. The Montrose Parkway, including the Montrose Parkway East, is arguably the infrastructure linchpin of the White Flint sector plan. 2. Opponents often claim it is incompatible with the White Flint street grid, which misses the critical point: Montrose Parkway is not and was never meant to be part of the White Flint urban street grid. Its primary function, in fact, is to keep traffic that is not destined for White Flint off of that local street grid. That actually makes it safer for the pedestrians and cyclists we are encouraging to use those alternate modes of transportation to get around the urbanized Pike District. 3. Montrose Parkway, especially including the eastern extension, is critical to the success of retail and restaurant businesses in White Flint. The parkway's secondary function is to bring patrons of the businesses in the Pike District who live elsewhere in the County into the "downtown" from places like Wheaton, Aspen Hill and the I-270 corridor. Increasing trip times will only send those drivers to other commercial destinations. With a private-sector economy increasingly termed "moribund" by even the most progressive voices in the County, a loss of more than 2000 retail jobs since 2000 (according to the Maryland Retailers Association), and a stagnant restaurant sector (according to Melvin Thompson of the Restaurant Association of Maryland), we can hardly afford to self-sabotage White Flint. 4. 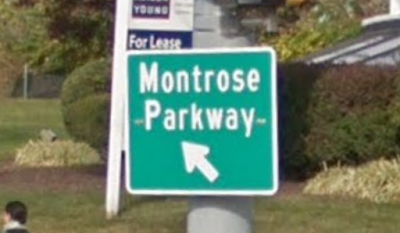 The Montrose Parkway is a vital piece of a cross-county right-of-way known as the Rockville Facility. It was placed in earlier master plans as a future road to handle what everyone tells us will be a massive influx of new residents and development between now and 2040. The Rockville Facility extends from Falls Road in Potomac along Montrose Road and the Montrose Parkway to the Intercounty Connector, near the former site of the Indian Springs Country Club in Layhill. For that reason, any attempt to downsize or intentionally slow traffic on the parkway will have dire repercussions far beyond the Pike District. It is gambling away what little capacity and valuable right-of-way we have left in reserve. The reality is, there is no other such east-west route available for a road. 5. Failure to build the extension, including the grade-separated interchange at Parklawn Drive, would forever stain the records of those who cast such a vote. There are four major infrastructure projects that were promised by all stakeholders in exchange for profitable development opportunities at White Flint, a $72 million developer tax cut, and hefty campaign checks for the Montgomery County Council. Only one of them, the Western Workaround, is currently moving forward. Still unprovided by the County Council are the new elementary school, the new MARC station, and the Montrose Parkway extension. Very similar to the Council's bait and switch betrayal of upcounty residents with the M-83, cancellation of the Montrose Parkway East would prove that councilmembers only give lip service to necessary infrastructure in order to ram through the development. That's exactly the attitude that caused term limits to pass by an overwhelming vote by County residents last fall. 6. Funding for the Montrose Parkway vs. other long-delayed infrastructure in the County is not a zero-sum game. The parkway is an essential piece of infrastructure upon which all of the current and future development in White Flint and White Flint 2 will rely for adequate transportation capacity, and to promote the success of a walkable urban street grid amongst its new developments. It is not something that can simply be deleted because funds are tight, or because the Council has dropped the ball on infrastructure countywide. That's not the way planning and infrastructure work. Much like M-83, the time to fund and construct the Montrose Parkway East is now; based on what County officials are hinting at for the redevelopment of Aspen Hill, Glenmont and Wheaton, it won't be long before we'll have to start planning future extensions to Connecticut Avenue (where ramp stubs are already in place for the road's planned cloverleaf interchange), Georgia Avenue and the ICC. 7. There are enough major development opportunities at the Montrose Parkway-355 interchange that we don't need to sabotage the parkway to create a smaller one near Parklawn. Air rights above the entire interchange can be sold to any interested developer. Along with the orphaned, pointless parking lot north of Pike & Rose, decking above the interchange could eventually create a seamless pedestrian connection between that development and a redeveloped Montrose Crossing. The County Council's vote will cement their historical position as either responsible, honest stewards of growth and infrastructure (and I realize that is, frankly, a laughable thing to say about this Council) at White Flint, or a radical, war-on-cars mob of firebrands who have no qualms about burning down the foundations of the sector plan they passed unanimously in 2010. I'm so glad I moved away from the area that would have been served by that extension. It's never going to be built and the people who live around there suffer an ever increasing traffic burden. we should invest in more metro.